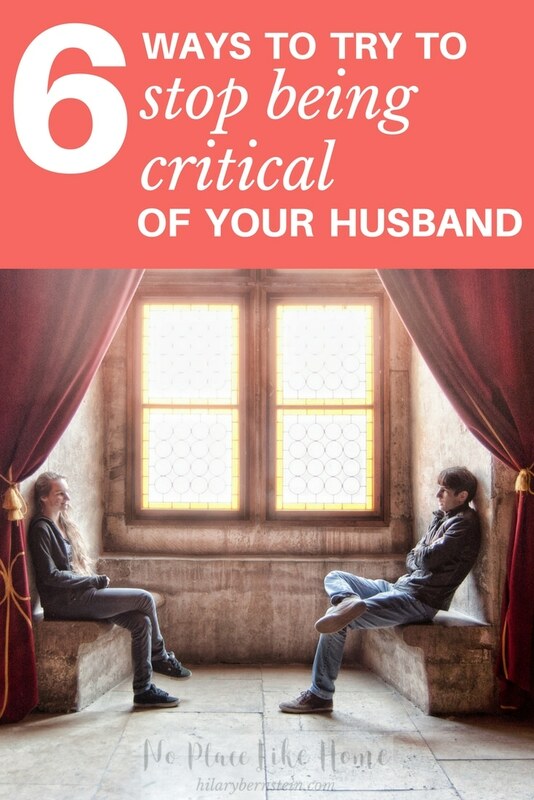 When you want to try to stop being critical of your husband, here are 6 things to try! I’m sure you already know this very well – and you’d never want anyone to hold you to a standard of perfection. But all too often, we as wives expect perfection from our husbands. How easy is it to scrutinize your husband? Because you know him better than anyone else does, all of his strengths and weaknesses seem magnified. The danger comes when you dwell on his weaknesses instead of affirming your husband’s strengths. Unless I’d feel comfortable with my husband picking apart my every word, mood, and decision, (I definitely would not want that!) I’d better not do the same to him. Sometimes we may be very justified in our criticism. Our complaints might be absolutely valid. But what we, as wives, often fail to realize is that our critical scrutiny eats away at our marriage like a cancer. We’re less likely to see the truly good things in marriage because we’re too busy focusing on and complaining about the bad. Our complaints, like weeds, flourish when we don’t keep a careful watch over our thoughts and words. 1. Remember your own flaws. Whenever you’re tempted to be critical, stop and remind yourself that you’re not the picture of perfection. When you think of your shortcomings, extend some grace to your husband. You’re two imperfect people living life together. If some of his decisions make you feel like you might start to lose your mind, remember that you don’t make right choices each and every time, either. And hopefully, your husband doesn’t point out all of your mistakes. While it can be so hard to not say something, try to see things from your husband’s perspective. 2. Be quick to forgive. Remember that just as you’ve been forgiven much, you also need to forgive much. 3. Imagine your life without him. I know it sounds ridiculous when you’re frustrated to imagine your life without him – if you’re really upset, that idea might sound like it could possibly be a blessing, right? But imagine not having him in your life any more – either separated by death or divorce. Don’t dwell on these thoughts too long, but just imagine the sorrow and pain that you’d get by never getting to talk with him or see him ever again. Imagine what would be missing from your life. Since you do still have him in your life, be glad for that. Life is short, and each day is a gift – you never know how much time you actually have left with your husband. Try to make the most of it and move past any petty complaints. When you’re tempted to criticize what your husband is saying or doing (or not saying or not doing), try to think about the right things he does and says. When you do think of the good things, praise him and thank him. He’ll appreciate what you’ve noticed – and he just may strive to get your praises again. 5. Do something nice for him. Even if you feel like you’re justified in your criticism, try doing something nice for your husband anyway. It doesn’t have to be huge – but something that will make his day easier. Try to do this with a joyful heart – and try to do it out of love, making sure he knows you’re thinking of him. 6. Remember he’s just a man. This may seem obvious, but your husband is just a man. Not Superman. Not the Lord Almighty. He has no ability to read your mind or leap tall buildings in a single bound. He may be your super hero on some days, but most other days he’s just a little boy who, over time, grew up into a man … and became a husband. Remember to think of him as the mere mortal that he is. As you remember your own flaws, forgive quickly, remember that each day together is a gift, accentuate the positive, reach out by doing something nice, and remember he’s just a man, your critical spirit may disappear quickly. And that’s good news both for you and your husband! 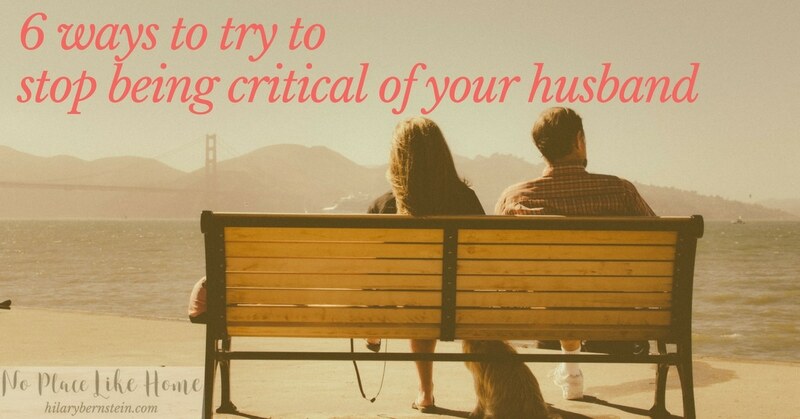 What do you do to try to stop being critical of your husband? Disclaimer: I am a trained journalist – not a trained counselor. If you need help with your marriage, please seek the counsel of a professional. Hilary ~ I enjoy your website and often refer other women to it. May God bless you for the encouragement you provide as we try to walk out our faith as Christian wives! I was thinking of my stepson while reading this post and it occurred to me that I want to be the kind of wife to his dad that I would hope his future wife will be to be to him. In other words, a Titus 2 wife. Thank you for following the leading of the Holy Spirit & writing this article! Thank you so very much for your kind words, Ann! They truly mean so much to me. Thank you for the reminder to be quick to forgive. Its often much easier to focus on the hurt or dwell in a state of resentment when I’m only thinking in the flesh. But turning my thoughts toward the Spirit and letting go of feeling wronged and angry, always helps resolve the situation quickly and more efficiently. Thank you for humbly sharing your own experience to encourage me and others. Great read!! Definitely helped a lot!